The stem contains a rolled paper marked with the scale being used. There are a great many different hydrometer scales commonly used to measure liquid densities in: petroleum crude oil marketing and refining; making wine, brewing beer and making whiskey; refining sugar; producing sulfuric acid and other industrial chemicals. In the past, hydrometers have also been referred to as gravimeters, densimeters or areometers. 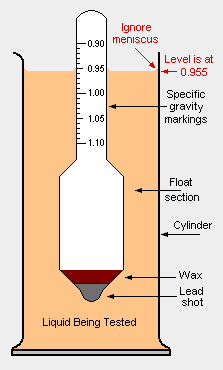 If the float section (see adjacent drawing) includes a built-in thermometer, the instrument is then referred to as a thermohydrometer. The specific gravity of a liquid or solid is the dimensionless ratio of the density of the liquid or solid at a given reference temperature to the density of a given reference material at a given reference temperature. The given reference material is usually water and unless the two reference temperatures are explicitly stated, they are generally taken to be 4 °C. Note 1: The specific gravity of solids can be determined by using a pycnometer rather than a hydrometer. Note 2: Hydrometers are not used to determine the specific gravity of gases and this article does not include any discussion of the specific gravity of gases. Note: 60 °F is equivalent to 15.56 °C. Note: Many literature sources present the above equations with the specific gravity reference temperatures being 20°C, which ignores the small difference between specific gravities at 60 °F and 20 °C. The origin of the Plato scale lies in the Balling Scale developed in 1835 by Carl Joseph Napoleon Balling which was recalibrated by Brix in 1854 and renamed the Brix scale. In 1918, Dr. Plato then developed his scale by improving and correcting Balling's original work. Basically, the Balling, Brix and Plato scales are identical up to the fifth and sixth decimal place. The leather tanning industry uses a Barkometer that expresses specific gravity in Barkometer degrees. The dairy industry uses a Lactometer calibrated in Quevenne degrees in testing milk. The alcohol industry uses the Sikes, Richter, or Tralles scales on their Alcoholometers. Each of them reads the volumetric percentage of ethyl alcohol in water. Knowledge of relative density or specific gravity has been with us since the days of Archimedes in 250 BC, with the observation that light objects can float while heavier ones will sink in water. Hypatia (born ca. 350 and died 415 AD), a Greek scholar from Alexandria in Egypt and considered to be the first notable female mathematician, is reputed to have invented the hydrometer. Several key figures in the history of science have mentioned the hydrometer in their work, including Galileo in 1612. In the 18th and 19th centuries, industrial development in Europe spurred the need for the hydrometer. It gained fame due to public controversy over alcohol taxation since the hydrometer was used in the distillation industry to measure alcohol content and determine excise taxes in England. A great deal more detailed history is provided in the book, edited by Holmes and Lever, about the history of instruments in chemistry from the days of the alchemists through the creation of the modern chemistry laboratory. ↑ API Gravity References the publication: Ernest L. Ruh, James J. Moran and Robert D. Thompson (1959). Measurement problems in the instrument and laboratory apparatus fields. American Association for the Advancement of Science (AAAS), Page 29. AAAS Publication No. 57. ↑ 2.0 2.1 Perry, R.H. and Green, D.W. (1984). Perry's Chemical Engineers' Handbook, 6th Edition. McGraw Hill, Inc., page 1-19. ISBN 0-07-049479-7. ↑ 5.0 5.1 Jean L. Jacobson (2005). Introduction to Wine Laboratory Practices and Procedures, 1st Edition. Springer. 0-387-24377-1. ↑ Roger B. Boulton, Vernon L. Singleton, Linda F. Bisson and Ralph E. Kunkee (1996). Principles and Practices of Winemaking, 1st Edition. Springer. ISBN 0-8342-1270-6. ↑ Hydrometers From the website of the National Museums of Scotland. ↑ Mothers of Invention Ethlie Ann Vare and Greg Ptacek, 1988, pp. 24-26. ↑ Frederick L. Holmes and Trevor H. Levere (Editors) (2002). Instruments and Experimentation in the History of Chemistry, 1st Edition, 2nd Printing. The MIT Press. ISBN 0-262-08282-9. This page was last modified 22:38, 7 June 2010.